The Apus or gods of the mountains had put people in a fertile valley, where they prospered under their protection. Life was good and people were happy, things would stay that way forever as long as they obeyed the Apus’ only prohibition: that they never escalate the mountain where a sacred fire burned perpetually. People obeyed, but the Devil was unhappy of seeing them do so, and persuaded them to compete among themselves to see who was courageous enough to defy the gods and escalate the forbidden mountain, and they all agreed to go fetch the sacred fire. Unfortunately, the Apus caught them midway, exterminated them, and sent pumas to eat those staying in the valley. At the sight of the destruction of his creatures, Inti, the sun god, cried and cried for so long he inundated the valley. Only a couple survived this flood of tears in a reed boat. Once the flood passed over, they found themselves in the midst of a great lake, which had drowned the pumas sent by the Apus, turning them into stone statues. 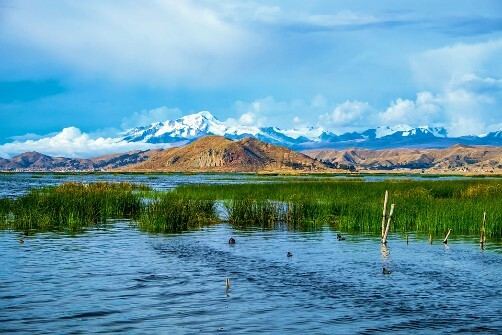 The couple then decided to call the lake Titicaca, which in their language means "lake of the stony pumas".